The "Anchors" frame contains a table with a list of input anchors. Adding anchors is performed in the "New anchors" dialog window. The inputted anchors can be edited on the desktop with the help of active objects. 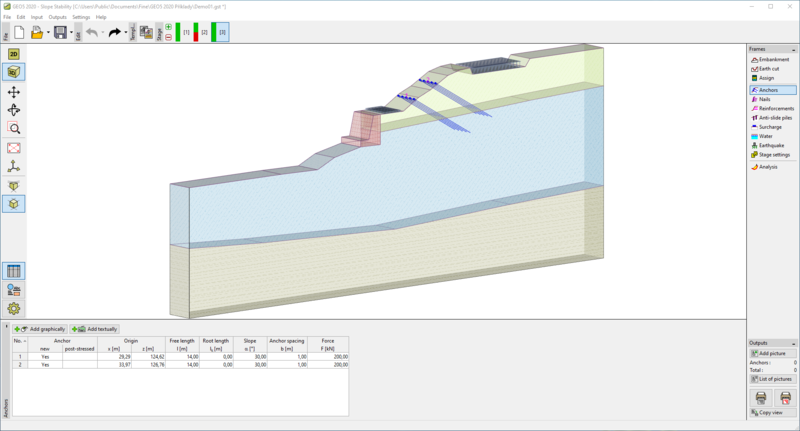 The dialog window serves to input the location of anchor (starting point x, z), its free length l, root length lk, inclination of anchor α, spacing between anchors b, shift of anchor row bs and pre-stress force F. Starting point of the anchor is always attached to the terrain (ground surface). All input parameters can be modified in the stage of construction, in which the anchor was introduced. In subsequent stages the program allows to modify the magnitude of an anchor pre-stress force (by checking the "Anchor post-stressing" option). Influence of anchors on the analysis is described in more detail in the theoretical part of the help.